(KPL) The British Embassy Vientiane has announced that this year nine Lao scholars were selected to study in the United Kingdom for a master’s degree under the UK’s government’s prestigious Chevening Scholarship programme for 2018-19. This is the highest number of scholarships awarded to talented young Lao candidates since the re-opening of the British Embassy in 2012. These scholars will study programmes such as International Business, Tourism, Psychology or Education at world-famous universities such as the University of London. The embassy was especially proud to announce that for the very first time Laos is sending a Chevening scholar to Oxford University, currently ranked as the best international university in the world. In the meanwhile, the new application period for Chevening Scholarships is now open. Interested Lao people may submit their applications until November 6, 2018 to www.chevening.org/apply. Chevening Scholarships are awarded to individuals with demonstrable leadership potential who also have strong academic backgrounds. The scholarship offers full financial support for future leaders to study for any eligible master’s degree at any UK university whilst also gaining access to a wide range of exclusive academic, professional, and cultural experiences. “We are looking for ambitious, professional, forward-thinking leaders from any walk of life. 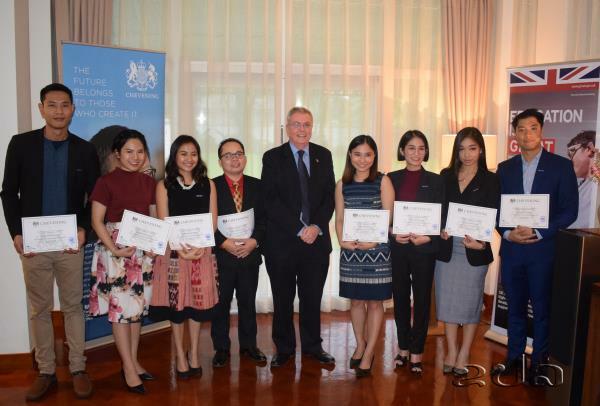 There is no such thing as a “typical” Chevening Scholar, but one thing that all of our previous scholars have in common is that they were bold enough to step forward and apply,” said Hugh Evans, British Ambassador to the Lao PDR. ‘If you are chosen for Chevening, you will receive a first-rate UK education which can open doors in your career. You will also become part of the global Chevening Alumni network full of dynamic influencers who have shared the same experience as you will, and can offer mentorship, advice, and contacts,” said Hugh Evans. More information on eligibility and selection criteria is available at www.chevening.org/apply/guidance and from the British Embassy’s page www.facebook.com/UKinLaos.